Is My Gutter Leaking or Is it my Roof? Do you have water dripping from your eaves and you need to find out how to stop it before it causes damage to the lumber and compromises the eaves structural integrity? 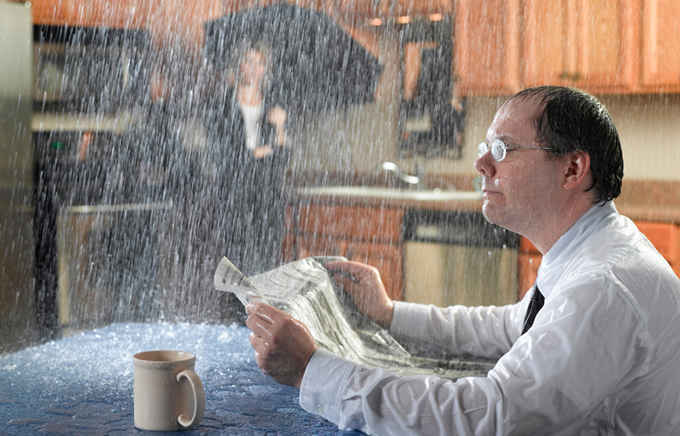 Should you call a gutter contractor? Will he come look at it just to refer it to a roofer that will turn you back to the gutter guy to solve the leak? In this blog, I will give you a nearly fail-safe way to determine the cause. First you need to know the components that usually make up an eave. Eaves are made up of: Fascia (the vertical component that the gutters would fasten to, and Soffit (the bottom of the eave). There are two main types of Soffit and Fascia eaves. 1) Aluminum Soffit and Fascia (this is maintenance free, paint clad aluminum that covers the lumber that is used to build the eaves) and 2) Open Soffit Eaves (exposed rafters visible from standing under the eaves and looking straight up). If you are reading this blog, it is probably safe to say you can identify the rain gutters as they fasten into the fascia and collect water run off. 1. If the water drip is coming from between the gutter and aluminum fascia, it is almost always because the back of the gutter was not installed up under the drip metal flashing (located under the first course of shingles). Below is an example of drip metal that does not flash into the gutter properly. You can see the white drip metal just above the gutters, does not flash down into the gutters. This allows water to get behind the gutters and run down, dripping between the gutter and fascia. 2. If the water is dripping between the fascia and soffit, or from the soffit alone, it is most likely coming from the roof. 3. If the dripping is coming from the gutters end caps, miters, or downspouts, it is a gutter issue. Exceptions to these rules do exist, however, they are rare. This will give you an opportunity to call a contractor to fix the problem.